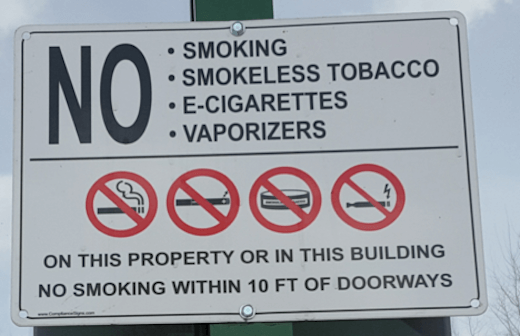 Johnny Welsh shows us some interesting signs due to Colorado's newer laws. 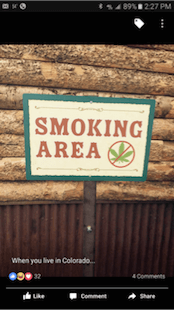 I’ve been tracking the results of laws allowing the recreation use of marijuana since the publication of my book, “Weedgalized in Colorado: True tales from the High Country.” These signs reflect both the helpful messages and strange behavior of citizens and visitors to Colorado. 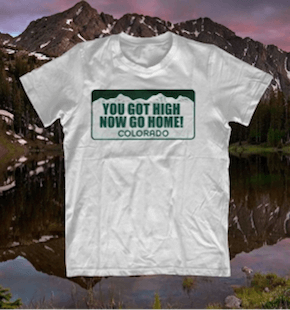 Since 2014 I’ve had a birds-eye of the cannabis legalization experiment from behind a popular bar in Frisco, Colorado. The things that exist here would blow the mind of those who live in states where it is not legal. What kind of things have changed in the past three years since pot became legal? My photos should tell you a lot! This is the sign you see when you ride the chairlift at Keystone Ski Resort, which is located on the national forest system land. 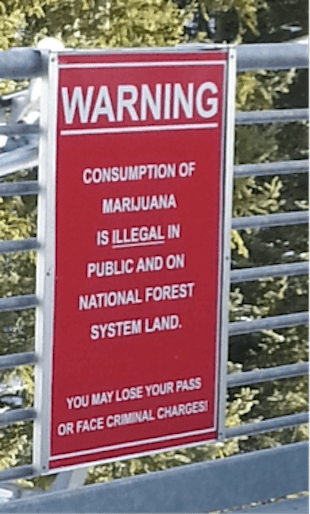 People think it is okay to smoke up on the ski mountain and are unaware that it is actually against the law to do so. I don’t know why anyone would even think it is okay to mail marijuana, but they sure do try. 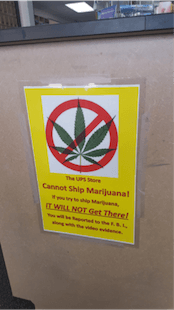 This is the sign at the UPS store. I hope this isn’t a measuring stick as to the education level of some of the new residents. The fact that this sign exists might support such a notion. The above sign hangs above the Breckenridge Rec Center. Who smokes while in a workout facility anyway? 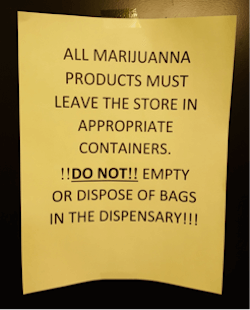 This is a sign that I saw on the back side of the bathroom door in a dispensary. 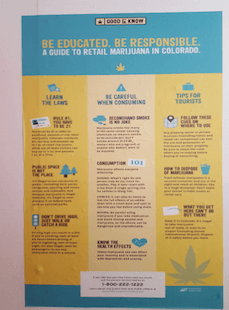 The Good To Know campaign does a great job in educating the public on the rules and regulations of cannabis consumption. This was a poster that I saw on the inside of a bathroom door of a burger stand in Glenwood Springs. On this very same day, I noticed that some of the gas stations in Grand Junction are now selling marijuana pipes (bowls) out of nice blown glass. Oreo cookies sold next to weed paraphernalia? What next? In Colorado, one never knows what to expect. This one has to be one of my favorites! 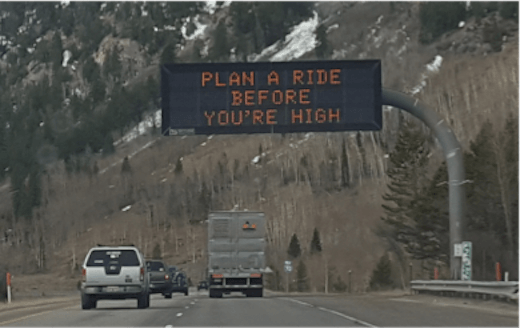 Plan a ride before you’re high on Interstate 70. Some of our highways are adopted by dispensaries. I like the no marijuana circle with the red line through it. 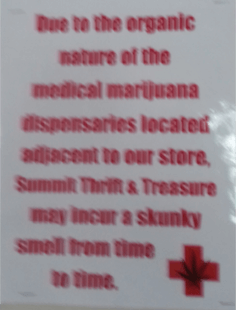 “Due to the organic nature of the medical marijuana dispensaries located adjacent to our store, Summit Thrift and Treasure may incur a skunky smell from time to time.” There is actually a law against strong odors coming from the grow facilities. If a complaint is filed, the business is required to fix the issue. Many times this requires an air filtration system costing the owners upwards of $30,000! On a recent trip driving into Mexico, my vehicle was detained and they said they were going to get the K-9 units to sniff my car simply because I have Colorado plates. The guard said that since I am from Colorado that transporting medical marijuana is not legal. I told her I was well aware of this fact. I jokingly asked her why anyone would want to bring Mexican weed to Colorado? Didn’t she know that some of the highest quality strains are being created in my home state? Since the legalization of marijuana in 2014, there has been an influx of new residents. I think the figure is right around 2.1 million people have moved to Colorado during this time. It is causing traffic issues, rents to soar, homelessness and trash everywhere. There used to be places we liked to call open space and that now seems like a term of the past. The hottest topic behind the bar when I bartend is how busy everything is getting. The next three photos give an idea of just how bad it is getting. I have lived a little town of Frisco, Colorado for twenty years and I never heard people honking horns at each other on Main Street. This happens on a regular basis now. The town is not a small town anymore. Johnny Welsh has worked as a professional bartender in Frisco, Colorado, for almost twenty years. He is a published author of Weedgalized in Colorado and The Owl That Preys Upon Us. Born in Atlantic City, New Jersey, he has a BA in Italian Language, Literature and Culture from Syracuse University. Few people have heard more—or more varied—tales than Johnny the Bartender.